How to use my money. Donation? Moon travel? First, I have always been actively involved in helping children from developing nations and assisting disaster stricken areas around the world. After the large tsunami and earthquake in Fukushima and after other natural disasters that have followed, both my company and I personally have engaged in relief efforts through donating supplies and financial support. Also, I’ve personally been helping children in developing nations across the world through an organization called World Vision for almost 20 years. I’ve never really publicized my philanthropic activities, but I feel the need to do so now that so many people have accused me of doing nothing. Whether that makes me look good or not doesn’t matter to me – I simply want to share the facts. I still feel guilt that all I’ve done is send financial aid and supplies to those in need while professional NPOs and volunteers do the hard work on the ground. When you think about the actual work of helping others on-site, it logically makes sense for trained professionals to be left in charge. But, I feel inadequate and lacking every time I order a wire transfer or when I receive a very polite thank you letter in return. I feel deeply moved when I witness celebrities take action and visit disaster areas to help cook food or sing a song to brighten the spirits of victims. It leaves me with a strong desire to take action myself. So, what can I do? I arrived at a conclusion to this question after witnessing the 911 attack on the twin towers in New York City. After watching the two planes fly into the towers, a sight so unreal and terrifying that one could mistake it for something from the movies, I made a decision. I was 25-years-old at the time. 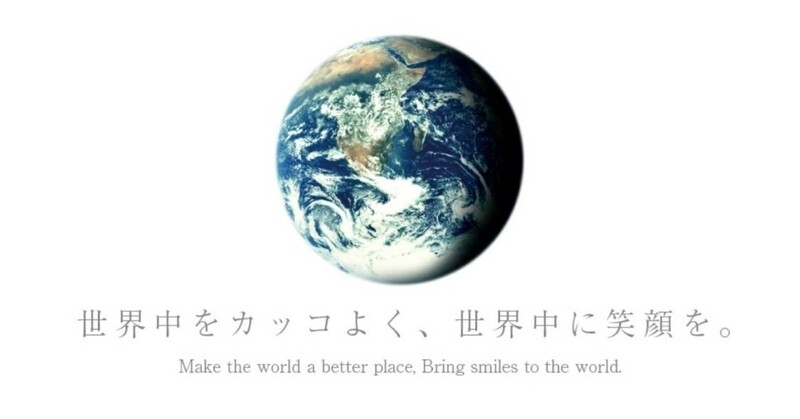 Immediately after the 911, I decided to set our company’s corporate mission to “Bring Peace to the World” and our corporate philosophy to “Make the World a Better Place, Bring Smiles to the World”. I shared this with our employees and prominently posted this on our company website with the picture of the round Earth you see in this post. I wanted my customers and shareholders to understand what I really want to achieve with my company. It’s been 17 years since then, and although my thinking has changed ever so slightly, my core beliefs have not wavered. I want to contribute to society by doing the things I’m best at, and to do my part, as small as that may be, in realizing a more peaceful world. I may not be able to fly into disaster zones and cook and sing, but as an entrepreneur there are definitely things I can do to make a difference. I want to bring smiles to people through my work and business. I want to make connections with people and make their lives more fulfilling. Hiring people and paying proper taxes on the profit we make, giving back to society, helping the next generation of entrepreneurs dream big, redefining and updating the very definition of how fun work can be — these are things that I believe I can do. I am paying my own money to go to the moon with the #dearMoon project. It’s a personal endeavor, but it does help raise international recognition of my company and my business. Some may say that I’m doing this as PR for my company, and that’s fine. The more my company becomes famous, the more I’m able to make a positive difference in the world and give back to society. And I believe my personal hobbies and interests can positively impact my business, helping us better serve customers across the globe with innovative and fun products. Any influence I gain through personal endeavors can then be used to help people and society. My policy is to “share joy with all through things I like.” My trip to the moon and my purchase of the Basquiat painting - these actions all stem from this core belief. I want to invite artists to fly with me to the moon, and I want to loan my Basquiat painting to many museums across the world. It’s like when you open an amazing bottle of wine to share with your friends, so you can all have a great time. I really want to see everyone smile. Sure, there are a lot of different ways to spend money, and people will have their opinions. I will actively continue my philanthropic activities while investing heavily in what I enjoy and what I’m good at. In my opinion, there’s nothing better than sharing a special experience with others and inspiring each other to experience joy. PS. This earth photo should be taken by me while going to the moon, and should be changed to mine after the return. i like your way and looking forward to see your photos from the moon ! I have some idea how to use the money, I'm happy to hear it as an investment story. It’ll make a many woman happy probably. I will continue to support you.